HEY ARE YOU READY TO MAKE SOME CR-AZZZZZZZZZZZZZY MONEY? Well you better be ready by November! According to Sega, they are going to unleash the Dreamcast classic to unsuspecting XBLA and PSN users this November. The bad news is that they didn’t give an exact date, but we only have a month and a bit to go before November anyway, so we could find ourselves with a definite release date very soon. I said it before and I’ll say it again, I love Crazy Taxi with all my heart so I’ll definitely be making an effort to pick this up. What about you? Ready for some more Dreamcast fun on your current gen console? Tell me your CRAZZZZZZZZZZZZZZZZZZY opinions in the comments. Mysterious Sega game called Samurai Bloodshow appears on the Appstore! Looking forward to this, one of the true great pick up and play games out there. The changed soundtrack doesn’t endear me to this port, but if the game play is intact, and the achievements are fun enough, then I may sprig for this. I’ll probably wait for when an inevitable sale hits (usually within a month or so, knowing SEGA!). I’ll check out the demo. Hoping it supports custom soundtracks somehow. Would love to drive to some hillbilly chase-scene music. The original soundtrack was good, but I don’t really care too much if they changed it. I’m not playing Bad Religion: The Game. I’m playing Crazy Taxi. The music would have to be Britany Spears to make me hate the game, and I assume that is unlikely. Turn it on and then do anything and it will be a hundred times funnier. Goddammit, yes! I was waiting for this to happen, and now I am happy face. The one thing I hope they add to the game…is your ability to crush anyone and everyone beneath your car. I’ll go with the demo before buying it as well. Hopefully Sega treats the port well and adds new game modes and stuff to keep it fresh rather just the high scoreness it was then. I’m going to guess that Sega probably won’t be adding any new modes. 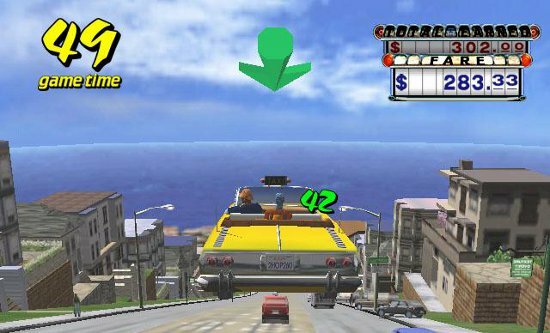 It will probably be a straight up port of one of the versions of Crazy Taxi that is available on other consoles. I’ve always wanted a two player mode personally. Despite the soundtrack change I’m actually interested in this. I played the one on the PSP, very interesting. If it is the same than I might get it. @Daguru77 – The PSP version is the one port I’ve never tried. I’ve always looked for it at stores but never found it in stock.